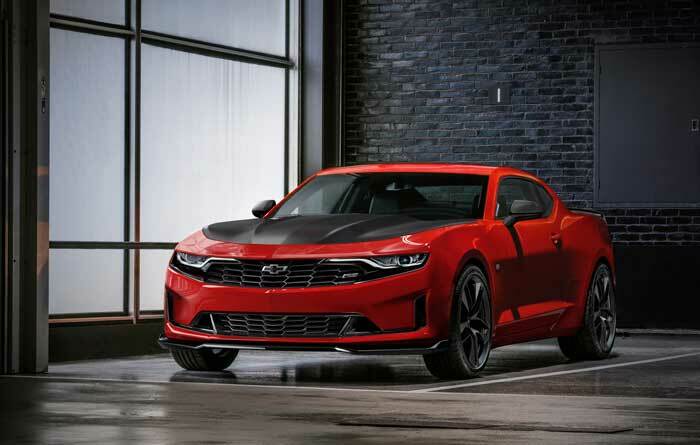 Chevrolet has gone official with the 2019 Camaro lineup that features new designs and new technology available. One of the new models is the Turbo 1LE. That Turbo 1LE joins the line with the V6 1LE, SS 1LE, and ZL1 1LE aimed at being fun on the track. The Turbo 1LE promises an “ideal weight distribution” and is only offered with a 6-speed manual. The 1LE packs FE3 suspension, staggered summer only tires, Brembo brakes, selectable drive modes, and a flat bottom steering wheel. Recaro seats are available. The 2.0L turbo engine makes 275hp and 295 lb-ft of torque. RS and SS models get new rear fascia and available dual-mode exhaust along with new 20-inch wheel designs. An RS appearance package is offered on the LT with LED headlamps and LED light bar. Some models have available enhanced performance data recorder system and standard with a rear-vision camera system.